I traveled a fair amount in 2009 to photograph various running events and runners. One of my favorite trips was to Ypsilanti, Michigan (near Ann Arbor) to shoot Boaz Cheboiywo, a talented Kenyan runner who will likely become a U.S. citizen this year. When you insert yourself into someone’s life for a couple of days and try to make great photos, there are a number of scenarios that can unfold. Sometimes the subject is hesitant or inpatient. Sometimes the weather is horrible. Sometimes, as was the case with Boaz, the subject welcomes you into his/her home with open arms, makes you dinner, invites you to be present at all their daily activities…AND the light is a perfect mix of subdued sun and clouds. The photography gods smiled on me this trip and I was thankful. To see the full result of this (including Boaz holding the ridiculously tall pile of chapati he made for dinner one night), you should pick up a copy of Running Times’ January/February issue, which is now on the newsstands. The article and some of the photos are also online. The image at left didn’t end up being the opening photo because a horizontal worked better, but it’s still my favorite shot of the trip. This was one of those wonderful times when I had a clear vision of what I wanted to do and it worked out exactly as I wanted. Driving around the vast open farmland where Boaz runs multiple miles every day by himself, it occurred to me a portrait of him amidst the corn could be powerful. We headed out to do a portrait session just before his second run of the day as the blue gray clouds of dusk were forming ribbons in the sky. There wasn’t much time before it would be too dark. I pulled over where there were ample dried cornstalks and tall honey-colored wheat, set up a flash unit on a lightstand, added a small umbrella, set it slightly off to the side and within the first few shots could tell my vision had been fulfilled. Boaz, by this point, was comfortable in front of the camera and seemed to know exactly what stance and expression to take without me saying a word. It could be that he is a natural, but I like to think that we’d spent enough time together at this point that he was comfortable with me. I never take photos upon first meeting my subject. I like to get to know them first without that barrier between us and believe it makes for better photos in the long run (no pun intended). 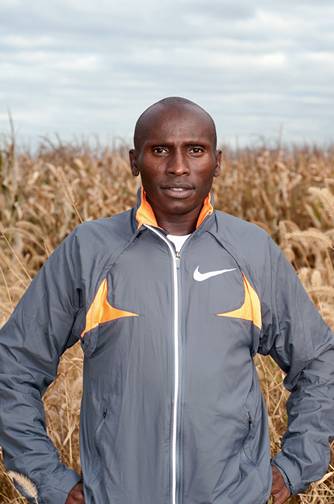 Boaz is running the Houston Marathon on January 17th. I will be rooting for him. He has not only put in long, lonely hours on the road, but he’s also an awfully nice guy—one that this country will be honored to call their own. This entry was posted in running and tagged Boaz Cheboiywo, Michigan, Running Times, Ypsilanti on January 12, 2010 by Stacey Cramp.